“You’ll fit right in” is a promise that Hope Church makes front and center on its website’s homepage. This Memphis, TN house of worship went above and beyond to back up that claim, welcoming parishioners with a major upgrade to its audio, video, and lighting that transformed their space. For the video lighting baseline, 4Wall’s Damon Herbert divided Hope Church’s stage into approximately 60 different areas, then plotted the lights’ position to ensure consistent light and color across the stage. The center of Hope Church’s multifaceted campus is the large sanctuary, which boasts a spacious 5,000-seat capacity, but it was due for an overhaul in 2015. Collaborating with AV integrator Technical Innovation and lighting integrator 4Wall Entertainment Lighting, this Evangelical Presbyterian church reimagined the main room in a way that would bring its message sharply—and spectacularly—into focus. An unabashed fan of Rush, a band famed for immersive concerts, Herbert helped Hope Church assemble a touring-grade lighting rig that exceeded expectations while staying on budget. Control for the lighting system came via a MA Lighting Dot2 console, and networking was achieved with two Pathport Octo eight-port rack mountable nodes, eight Pathport Nodes, and a Strand Lighting Vision.net integrated lighting management system. 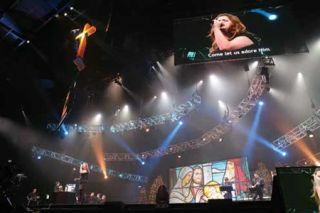 Hope Church in Memphis wanted a tour-grade lighting design for its sanctuary, which was paired with video and audio systems designed and integrated by Technical Innovation. Using a hybrid of LED and rear projection—comprised of two primary presentation screens, and five secondary displays—Paryzek and his team created an expansive visual landscape. Audio was also a star in the Hope Church upgrade, thanks to an innovative system design overseen by Scott Clark, senior audio systems design engineer for Technical Innovation. Clark’s objective was to ensure a uniform sonic experience for every seat in the house—no small task in a 200-foot-deep fan-shaped room where the furthest corners are 330 feet apart, topped off with a 26-foot ceiling height. Based on performance and cost, the optimal system proved to be 40 of the JBL VTX V20 speakers deployed in four arrays, bolstered by 12 JBL s28 subwoofers. Crown amps and BSS processing were selected, as well as a Midas PRO9 console—all capable, of an impressive 96 kHz sampling rate throughout. “If the source is clean, and the system is set up properly, 96k’s end result is less processed with a more natural and open sound,” Clark added.